AX25 V-Belt, Molded Notch Power King Cog. Replaces Gates-Goodyear-Optibelt AX25 TRI-POWER V BELT. 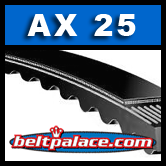 AX25 V-Belt, 27" Length, 1/2" Wide Molded Notch Power King Cog. Suitable for all industrial applications, particularly where small or sub-minimal sheave diameters are required. Replaces Gates-Goodyear-Optibelt AX25 TRI-POWER V BELT. Meets RMA static conductivity requirements.